Never before has this adage made as much sense to me as it did after I received my package of Powerboard by Hoverboard Self Balancing 2 Wheel Electric Scooter. This automobile is an improved version of the hover-board, only more attractive and cost-effective. It has been a remarkable journey for the adventurer in me since the following contents arrived at my doorstep. 1 100-240v AC Charging cable/Plug-In adaptor. The first quality that appealed to me was the design and the color scheme of this product. The one I ordered is in red and black. It weighs at 27 lbs/12kgs approximately, which makes it hefty enough to ride on, yet light enough to be carried around. The high-grade built ensures that this scooter won’t fall apart under you, if you happen to take a few tumbles in the beginning. 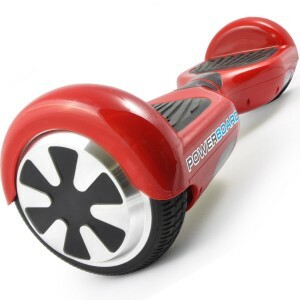 The recommended speed is around 4mph to 6mph but it can go up to 8mph when fully charged. The little beep sound when approaching high-speed keeps you under check. It takes 6 hours of usage to bring the battery down and only an hour to get it fully charged. The grip patterns of the foot rests are effectual in keeping you from slipping. It may take some time getting used to if you have no previous experience in skateboarding and balancing. I too had no prior experience (unless you consider clumsy falls on a regular basis as experience!) but could ride after an hour of practicing. The one year warranty it comes with makes it more trustworthy. I love the fact that it is environment friendly. The charge voltage required to power it is not high enough to strain any appliances. Powerboard by Hoverboard Self Balancing 2 Wheel Electric Scooter has a two tire self-balance structure with each tire being 6.5 inches apart. It requires zero degrees to corner, making instant 360 degree turns smooth. It has an easy drift due to the sturdy driver motors that are placed methodologically within the wheels to boost functionality. A slight pressure difference on the foot pads allows mobility at once. Once charged it will work up to 6 hours, navigating anywhere from 9 miles to 15 miles depending on your speed. The battery strength is 36v/4.4AH and they are lithium-ion batteries that take longer to deplete. It can carry up to 220lbs. It has a charger voltage of AC110V-220V 50-60HZ and charging time of 60 minutes. User interactive battery life display through an LED. It can be used on moderately moist surroundings but it is not waterproof. So do not immerse in liquids. The cover is fabricated from heavy-duty ABS+PC plastic and it is robust but not 100% scratch free. The tires are made of solid rubber and are not inflatable, resulting in zero chances of bursts. 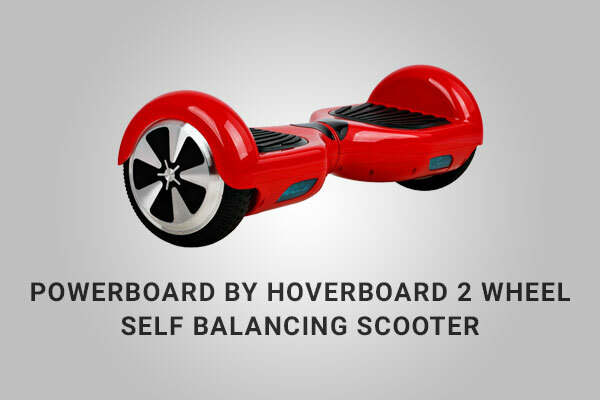 The first thing I noticed about the Powerboard by Hoverboard Self Balancing Scooter was its lustrous outer covering. It was glistening but that was not to be for long as I started using it immediately. It took me an hour to get a hang of it but I have to admit that even the practice sessions were such a delight. Once adept, I took it everywhere from grocery shopping to my office because I am someone who likes to do my bit when it comes to the environment. It has a built that does not support suspension system but it is not meant for high bumps. I lived my childhood all over again with this awesome tool that silently carried my 200lbs. The installation of motors is so clever that it is practically noise free. I particularly liked this feature as I hate declaring my arrival from a mile away. The plastic used is heavy-duty but not scratch free and this I learnt the hard way after bumping into things a few times. The battery life seems consistent, serving up to 6 hours at near top speed of 6mph. I generally navigate at this speed but you can go faster, which will bring the battery life down but not more than an hour. Overall, it is a very utilitarian product. I am planning to get one more for my kid brother who just won’t leave mine alone! Twin motors for extra drift and power. Two footboards with Grip enhancing design. Solid cover and outer casing. I had both my 14-year nephew and my 58-year-old mother try it, and they both have been fighting over it ever since! Walking my dog while sailing on my chariot, I finally enjoy the walks as much my dog does. 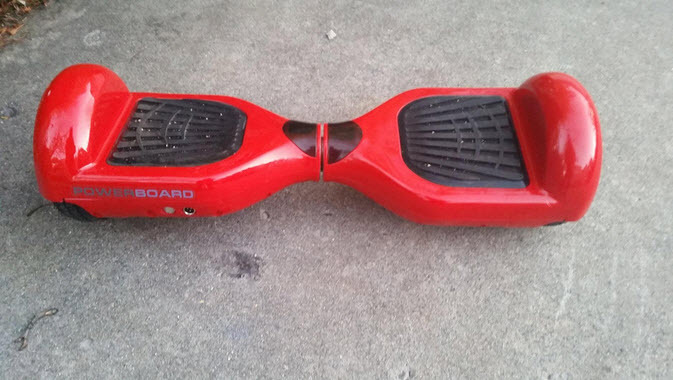 The rubber tires of Powerboard by Hoverboard Scooter do not go flat. The firm grasp of the wheels gives it a non-slippery mobility on all terrains. The absence of inflatable tires makes this scooter more portable. The delicate look of this scooter is gratifying to eyes but it turns into a mean machine as soon as you hop on it. You can breeze through your indoors on it. The speed and the power utilization of this product are pretty good for a machine that runs on batteries. It is a good abdomen exercise, considering all the balancing you have to do or at least I would want to believe so! It does not burn holes in your pockets like other fancy gadgets. Requires no visits to the gas station. It is not waterproof. I would have loved to squish through beaches. 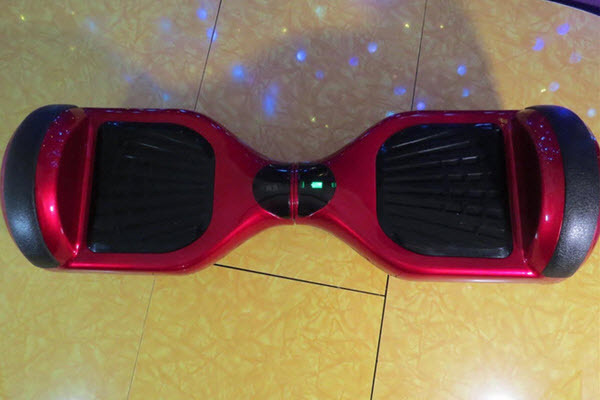 Be prepared to become an amusing sight while learning to balance on it, especially on tiled surfaces. The outer casing of the scooter is not easily breakable but it scratches easily. It is not built for very rough roads. You should buy it only if you plan to ride on concrete, cemented, and tiled roads with moderate coarseness. 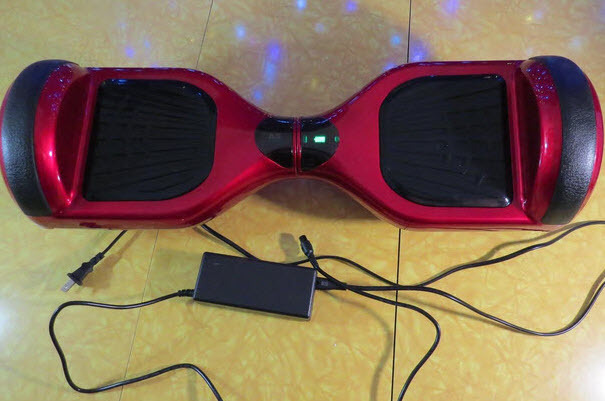 I did not regret buying Powerboard by Hoverboard Self Balancing 2 Wheel Electric Scooter even once and I am thrilled to endorse it. It has more attributes worth celebrating than there are to complain about. I can say this out of the experience – if you want more cheerful faces around your home, order this right away. The Powerboard Self Balancing Scooter is for everyone. I would advise the parents of children younger than 2 years of age though, to exercise caution while using this indoors. It is a long-lasting investment that you will be pleased you made.